While LRYGB has become a cornerstone in the surgical treatment of morbidly obese patients, concomitant cholecystectomy during LRYGB remains a matter of debate. 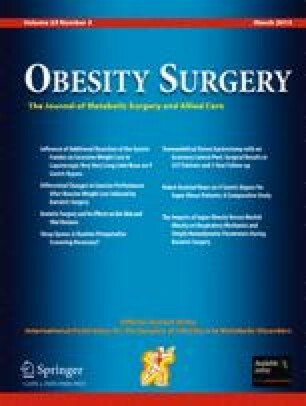 The aim of this meta-analysis was to estimate the rate and morbidity of subsequent cholecystectomy after laparoscopic Roux-en-Y gastric bypass (LRYGB) in obese patients. A meta-analysis was performed analyzing the rate and morbidity of subsequent cholecystectomy in patients who underwent LRYGB without concomitant cholecystectomy. Thirteen studies met the inclusion criteria. The rate of subsequent cholecystectomy was 6.8 % (95 % CI, 5.0–8.7 %) based on 6,048 obese patients who underwent LRYGB without concomitant cholecystectomy. The rate of subsequent cholecystectomy due to biliary colic or gallbladder dyskinesia was 5.3 %; due to cholecystitis, 1.0 %; choledocholithiasis, 0.2 %; and biliary pancreatitis, 0.2 %. The mortality after subsequent cholecystectomy was 0 % (95 % CI, 0–0.1 %). The surgery-related complication rate after subsequent cholecystectomy was 1.8 % (95 % CI, 0.7–3.4 %) resulting in a risk of 0.1 % (95 % CI, 0.03–0.3 %) to suffer from a cholecystectomy-related complication in patients undergoing LRYGB without concomitant cholecystectomy. A prophylactic concomitant cholecystectomy during LRYGB should be avoided in patients without cholelithiasis and exclusively be performed in patients with symptomatic biliary disease. R. Warschkow and I. Tarantino contributed equally to this study.